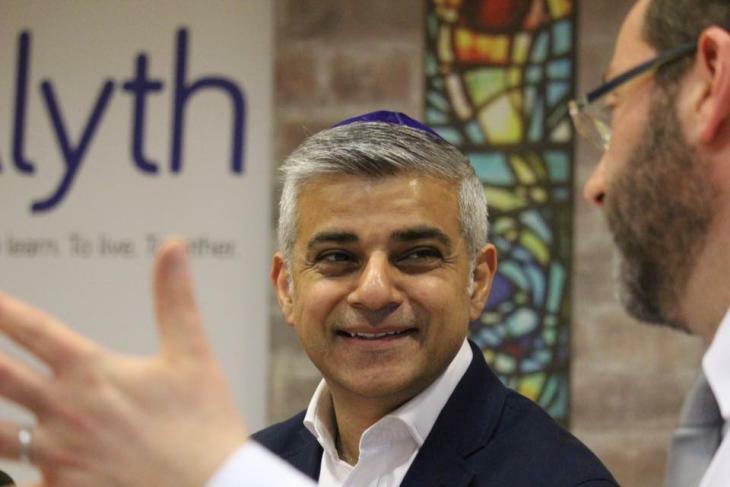 Sadiq Khan: "Londoners Think All Mayors Can Do Is Act A Buffoon"
Rachel Holdsworth Sadiq Khan: "Londoners Think All Mayors Can Do Is Act A Buffoon"
It's not often that going to interview a politician makes you hungry. But as we wait in the kitchen of Labour's mayoral campaign HQ, we can't help but notice piles and piles of jaffa cakes, Pringles and soft drink cans. "It's for the phone bank this evening," an aide explains. "It'll all be gone by the end of the day." 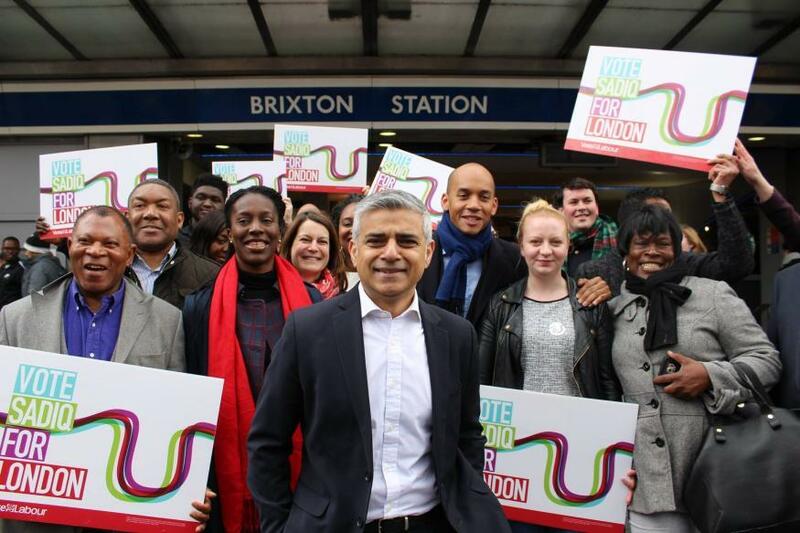 That's the kind of effort Sadiq Khan's team is putting in to make sure their man is elected next week. We're expecting a similar high energy onslaught when Khan arrives shortly afterwards, apologising for being a bit late. We open by saying we want to talk about fares. This is usually the signal for a candidate to launch into their prepared stump speech. But Khan sits and listens, waiting to find out what exactly we're focusing on. It's a bit... disconcerting. He keeps saying that Mike Brown, Transport for London's Commissioner, has commented that the Labour man's four-year fares freeze is possible. Is that a reference to a recent LBC interview, or has Brown told Khan this in person? I won't go into personal meetings I've had with TfL on many occasions," says Khan. "What he has said publicly is that my fares freeze will have no impact on infrastructure investment. I don't think it’s fair for me to talk about what he said privately. But I'm very confident that it will have no impact on infrastructure. The promise I'm making to freeze fares, that they won't go up a penny between now and 2020, is one I'm going to keep." We have concerns about where the money to pay for the freeze will come from. Has Khan, or his team, done a thorough audit of TfL's staff and processes, worked out what everyone does and who could be cut or departments merged? Or will they be trying to force cuts to pay for an arbitrary number? He gives us a specific example. "It's inefficient that the amount they [TfL] spend on agency staff has doubled. That's a response to an FOI I asked. Consultants plus agency [staff] equals £383m a year. Even the commissioner thinks we can reduce that by half. He then talks about cutting back on fare evasion, which he says lost TfL £61m last year. How does he plan to stop that? "Simple things, like don’t have barriers that are open all the time," he says. "Bromley by Bow, 60% of the time the barriers are open." So he's proposing getting more staff in? "There should be staff there anyway. That's inefficient, because what you’re losing in fares exceeds having somebody there." Khan goes on to raise the mess where TfL lost nearly £900m on a contract with Bombardier to upgrade signalling on the sub-surface lines. But, we counter, the London Assembly identified a lack of properly qualified, highly experienced (and therefore well paid) staff at TfL to recognise they were being sold a pup. "That's permanent staff," he says. "So rather than have £383m on temporary agency staff and consultants, why not invest in the future with permanent staff, which is what any good organisation does." Khan also plans to create new revenue streams. "Hong Kong's transport authority raises lots of money by savvy use of property, more than they raise by fares. [We should] use TfL land more sensibly. Keep the freehold, not have a fire sale, and build genuinely affordable homes for Londoners. Keeping the freehold keeps the revenue stream coming in. "There are other things we can be doing. At the moment there are 18 separate franchises to run our buses. TfL runs none of them. 40% of them are run by companies owned by the governments of France, Germany and Holland. Why don't we bid for some of these contracts? And also bid for contracts in other cities. We have expertise in the Oyster card and contactless cards. We could be selling some of that expertise around the world." What about the future? Khan talks about river crossings, stressing that he's deliberately using that phrase rather than 'bridges' or 'tunnels'. "What you should be thinking about is public transport, cycling," he says. 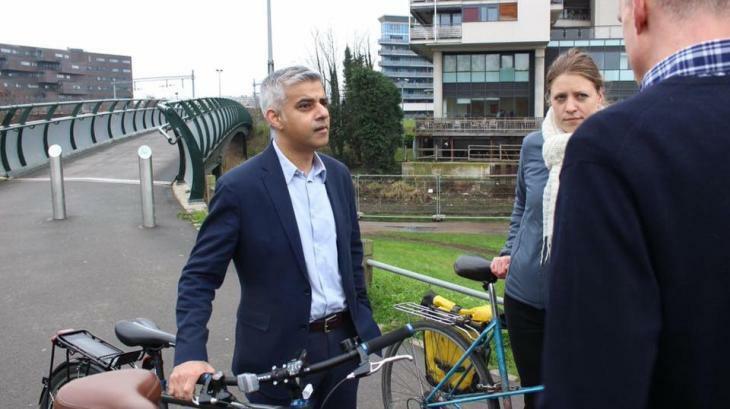 "My concern is that there's not a proper plan to have crossings that don't have an adverse impact on air quality, the environment and the people in the south east of London," he continues, referencing the controversial Silvertown tunnel plan. We then move onto housing. You're promising to build 50,000 houses a year, we say... "No, I'm not," Khan interjects. It turns out that while his manifesto acknowledges the experts' analysis that London needs 50,000 more homes a year to deal with the housing crisis, Khan is focusing on providing the right sort of homes, rather than getting hung up on numbers. "On TfL land, roughly speaking, we think we could get anything between 10,000 to 20,000 homes on there," he says. "But don’t forget brownfield land, local authority land, there's ex-NHS land, ex-schools, ex-courts, ex-police stations. We can build genuinely affordable homes to buy and rent. Either homes which are social rent — council properties — or London Living Rent — one third of average local earnings — or homes for part buy, part rent. The modelling we've done on TfL land, zones 3 to 6 means we think we can build part buy part rent with a deposit of between £5,000-£6,000 and then roughly speaking £1,000 a month." Where's the money going to come from to build all these houses? Khan starts to explain his vision for a new unit at City Hall called Homes for Londoners, which would bring together councils, housing associations, developers — and financiers. "There’s a lot of finance there. Housing associations have finance, for example. We've got private financiers who've expressed an interest in Homes for Londoners. But also private business. Deloitte has bought a building for their staff because the staff can’t afford to live in London. I’ve spoken to chief executives who say they're regularly getting requests from staff to be transferred to Belfast or Leeds because they want a family, a home with a garden. "We could build properties which are private rented sector which means you, as a business in London, will have housing for your staff. That provides a revenue stream which we can use to build genuinely affordable homes to buy and rent." This is all fine if you can get what will be, at least at first, one of a small number of City Hall-managed homes. But more people in London now rent privately than have a mortgage. It's difficult for the mayor to intervene because it's a free market, but Khan has some ideas. We’re going to set up a pan-London, not for profit letting agency. Rather than going to a high street estate agent, you can come to us and we won't rip you off. If you want, we'll give you a three-year tenancy and during the three years the rent only goes up by inflation. Most landlords are pretty decent people. They're amateurs, it's their pension. Because they can't manage [the property] they give it to an estate agent to manage, and the agent rings them up every 12 months and says 'let’s flip the property and get someone else in, I can make you more money', because the agent gets commission from flipping. "We’ll say to landlords, give us your property for three years, we'll give you six months rent up front, we'll look after the property, do all the checks, and return the property in three years if you want it. The idea is that over a period of time, the combination of us being a letting agent and the London Living Rent, will stabilise the rental market. But also, the expectation is that commercial estate agents will have to raise their game and reduce their fees to compete with us." We didn't want to dwell too much on the tone of the campaign and the mudslinging around accusations of extremism, because Londonist would frankly rather focus on actual issues when we have a candidate in front of us, and the whole subject has been done to death. "I'm on record from before the campaign began, I said I hoped Zac's the candidate for the Tories because he’s a nice bloke. He’s independent minded, and I said if he's the candidate we’ll have a campaign fizzing with ideas. We've got different experiences, different visions, different perspective but it'll be a great campaign. And I have been disappointed by their campaign from start to finish. It doesn't improve the quality of life for Londoners." The whole mayoral campaign in general seems to be turning people off, we tell him. The highest turnout for a mayoral election was 45% in 2008. There are whispers in politics journalism circles that we'll be lucky if we get 35% this time around. What's gone wrong? "The impression that's been left is that the job of the mayor is to walk a red carpet, cut a ribbon, make a few jokes," sighs Khan. "But mayors can do a huge amount. There are the levers given to you by Parliament but also the pulpit of City Hall to persuade people to do things. If the mayor calls in the leaders of FTSE100 companies to a meeting to discuss publishing a gender pay audit, they'll come. The things we're talking about — housing, transport, healthier air, safer city, mayors can do that. It's tragically one of the legacies of Boris, Londoners think all mayors can do is act a buffoon. And that has an impact on turnout. The party handler calls a few minutes left on the interview, so we turn to lighter subjects in the hope of getting more of an idea of Khan the man, as opposed to Khan the politician. What's your favourite tube line? It’s got to be Northern line. I've used Tooting Bec and Tooting Broadway most of my life so I have to say that. We're guessing bus route is the 44? [Khan laughs] My dad was a bus driver, I'm not sure if you know this. Tooting to Victoria. What's your favourite museum or gallery in London? I used to work very near the British Museum so we used to go there a lot, just for coffees and stuff. My favourite exhibition of all time was the Hajj exhibition. First time ever they'd been lent exhibits from the Hajj and it was amazing. It was like you were there. For the people who haven't had the privilege of going to Mecca either as Muslims or non-Muslims, it gave you a feel for it. I’ve not been there recently, but I’ve been to the National Portrait Gallery to see Vogue 100. When I was growing up the Science Museum was the place to go, there was an earthquake simulator which was great. Where do you go to relax with your family? Near us we've got great parks, Tooting Common and Wandsworth Common. We all love shopping, I'm the worst. Both my daughters are critics so they’ll tell me if it looks not cool. Cinema's good, we saw Batman vs Superman recently. Not recommended. We like eating out. Whenever I can I spend time with my wife and daughters. What's your favourite view of London? Without a doubt, Waterloo Bridge. It really is gorgeous. The bridge itself is ugly but the view itself is gorgeous. Will the Garden Bridge enhance or detract from that view? Whenever you see a plan and it has the word 'landmark' you should always get suspicious. 'Landmark building', 'landmark bridge'. But I think the pictures are great and it looks exciting. There are questions about the procurement process which need to be looked into and there are questions about how much public money was being spent. If you have one final meal to eat in London, where do you go? It's got to be one of the Asian restaurants on Tooting High Street. I never say publicly which one because it makes the others jealous, but value for money, good quality food. It's always a good sign, whatever restaurant and type of food it is, if people from that background are eating there. You’ll notice that most of the restaurants in Tooting there are lots of people of Pakistani and Indian origin eating there.